Step 1: Growing from seed or small sprout?? 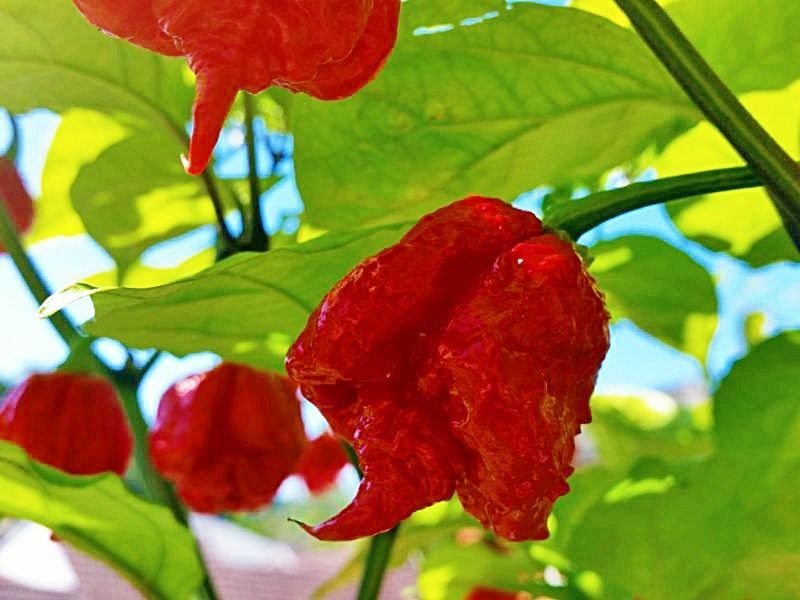 The Carolina reaper needs heat and light when germinating so I would highly suggest starting them in a mini incubator on a window ledge as you will get the most heat and plenty of sun. You could also grow them in a glass permanent green house provided it is hot enough and has plenty of light; however I would NOT recommend trying to grow them from seed in a mini plastic green house as I do not believe they would be ideal. The Reapers will need damp soil (NOT SODDEN), I would suggest using a mist gun when watering. Prepare your container, make sure there is some drainage in the bottom and sit it a receptacle to catch excess water (especially if on a window sill). Get some compost and fill your container to the relevant level (do not use large pots to start with an incubator tray is the perfect size). Wet the soil through with some water and poor the excess from the receptacle away. If you have a single seed try to plant it as centrally as possible, if you have multiple seeds space them evenly. For a standard size incubator use four seeds in one incubator. Place the seeds atop the compost, push them in half way and cover them. If using an incubator place the lid on top and leave in your chosen place; otherwise place in your green house. Your seeds are now getting ready to sprout, keep misting the compost well and keep it in the sun as much as possible. DO NOT FEED YOUR PLANTS AT THIS POINT! Try to resist repeatedly removing the lid as it will reduce the temperature in the incubator, you should remove the lid occasionally to allow fresh air inside (only once every two days). If the compost looks dry apply more water but not too much, if the compost looks too wet allow to evaporate. Not too much, not too little is the key. So all has gone well so far and the seeds have sprouted. Allow them to get to a largish size before transplanting to a pot. When you have your plants get a small pot and fill it with compost; get your plant from the tray making sure not to damage the root and put it in one hand. Use your other hand to make a hole in your compost and slide the plants roots in. Cover the bottom of the plant and press (or firm) it in with your thumbs so that your compost is lightly compacted, now water your plant plenty and leave it. Put your plant in a green house glass or otherwise; your plant needs to go in one either way. This chilli is damaged by sudden changes in temperature and will wilt. If you are using a pop-up or push together greenhouse then make sure you weight it down and put it somewhere with lots of sun e.g a patio. Apply water when necessary (every two days or so) but don't allow to go dry or sodden, I personally recommend buying a green house thermometer as it will help you look after you plant. 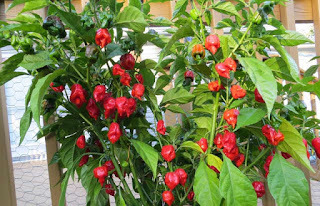 This chilli likes temperatures around 80 degrees tops and 60 minimum; although the plants wont die below 60 they wont be comfortable and will struggle to grow and fruit. Try to keep it in this temp range as it will aid growing greatly. Your plants are now growing bigger and bigger, they will need bigger and bigger pots or they will become pot bound. You can generally tell when it is necessary to change containers but if you are unsure hang on a bit longer. Keep your growing plant inside the greenhouse and keep watered. It wont be long until your chilli flower and fruit. DO NOT FEED YET!! it is very important not to feed yet as I will explain next. Once your plant has flowered it will begin to fruit, ONLY AFTER the plant has flowered should you feed it as it will help to produce a greater healthier yield. Use a fruit and veg feed, tomato feed will do fine. Soon you will have some strange looking fruit forming, the fruit will look disgusting when grown but that's just how they look and no you haven't grown some mutant killer pepper that will take over the earth. Once red harvest your peppers. If peppers are nearly ripe but not quite take them inside and leave them on some tissue in front of a window with sun and they will self ripen. Your plant will keep producing so make sure you can use them as you'll soon have lots.